Remember the classic Hokkien song, ai pia jia eh yia? This song translates as 爱拼才会赢 in Chinese and also "must fight in order to win" in English. Kind of tacky but extremely catchy, isn't it? Kind of like the fight song by Rachel Platten but this is an ultra-retro old fashioned kind... LOL! It was a popular song to sing along within the Chinese communities during early 80s and is still an forgettable karaoke song to sing among the older generation today. My grandmother loves humming and dancing in her kitchen and especially with this song. Me? The little me was sitting on her kitchen top singing along with her and watching her doing her happy things. I always remember how happy she was especially the scenes when she made orh kueh (meaning steamed savoury yam cake) for us to eat. I can't help to relate orh kueh to the ai pia jia eh yia song, associating both being an old-time Hokkien classic. Having said that, I'm not entirely sure if it originates from Hokkien, Teochew or Hakka communities. All I know is this nostalgic snack is popular among the Malaysian and Singaporean communities even until today. To start, I have gathered the ingredients. Mostly essentially, I need yam to make this cake! Plus, these to season the cake. Lastly, I need rice flour to "gel" up the cake. Cooking the garlic, dried shrimps and yam until fragrant. Give a pan a tap and use a spoon or spatula to spread mixture evenly in the pan. Depending on the steamer or the steaming heat that you used, the steaming time varies from 30 mins to 1 hour. To tell if the cake is cooked... the cake must be firm enough to touch. I was like Yeah!!! when I unmould the cake. ... and mostly importantly with this tau cheo (fermented soy bean paste). Making and cooking the sauce. Oh... I love this thick and luscious sauce. 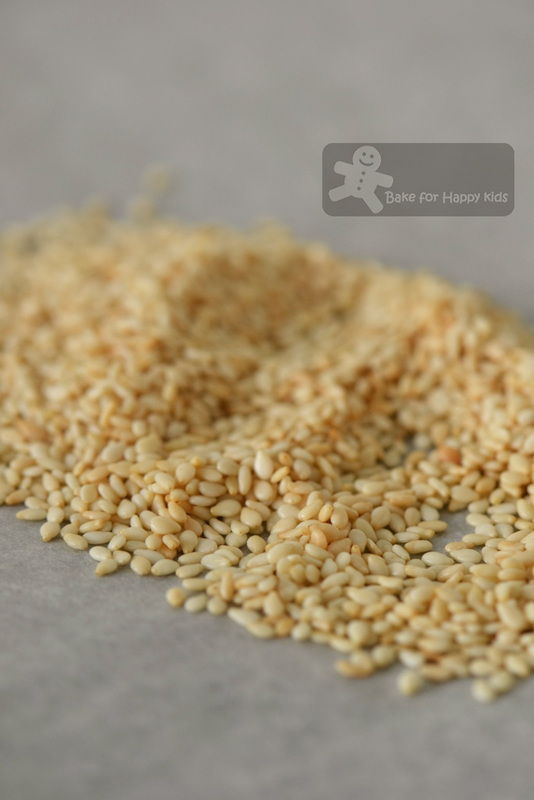 Lastly, I have lightly toasted some white sesame seeds. 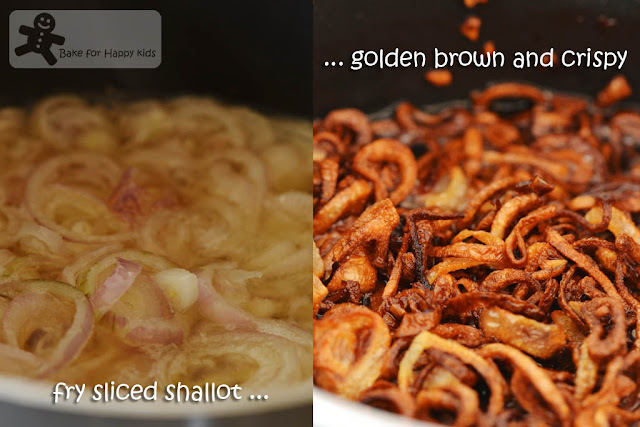 Not to forget my crispy shallots... Yum! This is my ultimate orh kueh enjoyment that is definitely worth fighting for! 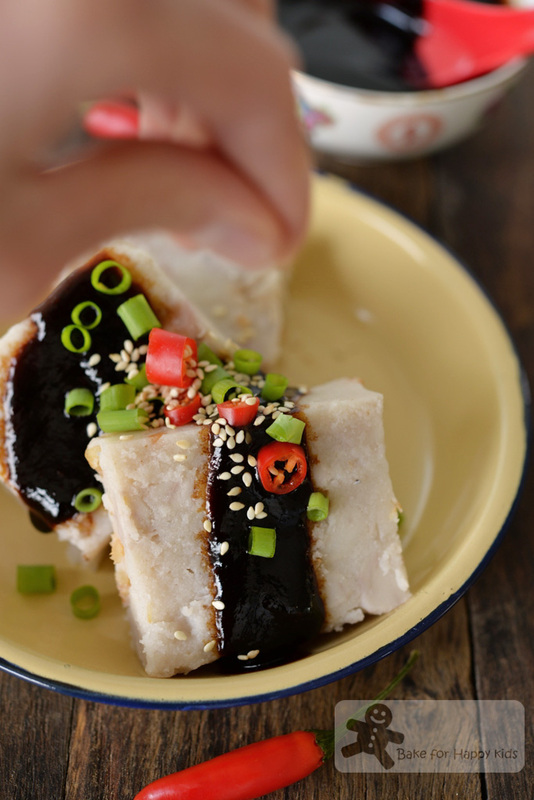 Although the humble orh kueh is commonly available in Singapore and Malaysia or even sometimes glam up as hot-selling dim sum in some restaurants, it is actually a rare delicacy in Melbourne. I miss orh kueh. And whether orh kueh is commonly available or not, I'm a strong believer that homemade orh kueh is the best and hope that you will like this most perfect homemade orh kueh that I have made. "Thanks mum. This is yummy..." My son is always so sweet showing his appreciation to my cooking. I wonder if he has inherited this good behavior from me... LOL! Me thick skinned? ... because I used to tell my grandmother how much I love her cooking including the times that she made the most yummy orh kueh for me. Traditional Yam Cake that is mostly adapted from the book, Reviving Street Hawker by Mdm Pang Nyuk Yoon. The original recipe from the book is pretty brief and so I have re-written the recipe with many details that I can remember from my grandmother's cooking. You can use double amount of this recipe to make one 25 cm or 10 inches round cake. 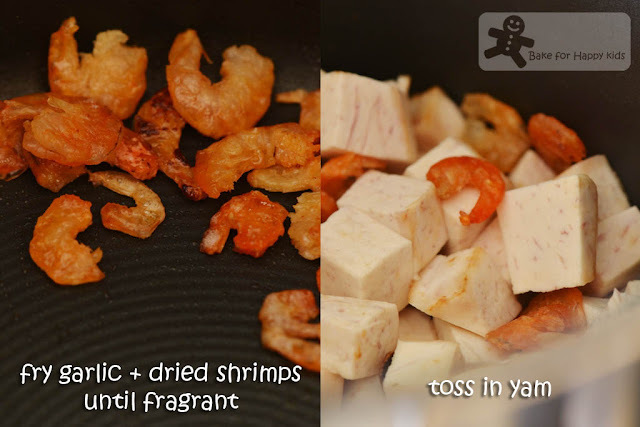 *For a lower manufacturing cost, dried shrimps are NOT commonly found in most commercially made orh kueh. Or sometimes, there might be shrimps in the higher-end-restaurant-kind of orh kueh but the shrimps are chopped into really tiny pieces . If you like your orh kueh to be the traditional kind with either no or small pieces of dried shrimp, you can either omit this addition or chop the dried shrimps into tiny pieces. For us, we prefer our orh kueh to be made with good amount of dried shrimps and really chunky for our taste and so I didn't chop the dried shrimps into small pieces. **the amount of water added can change the texture and tension of the cake. 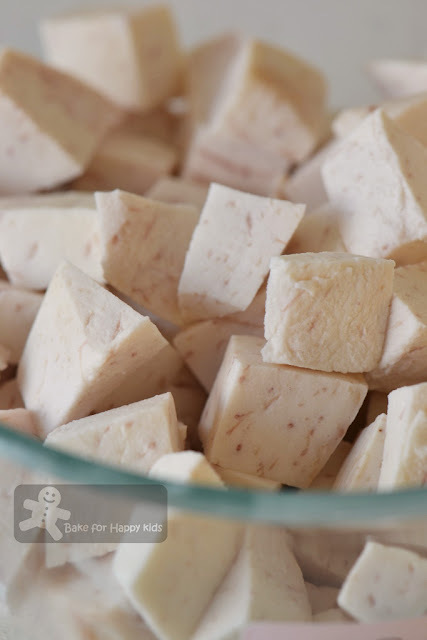 The texture of this yam cake is perfect for me but if you like something that is less firmer, you can add extra 1-2 tbsp water. Grease the interior of a 16-18 cm round pan with adequate amount of oil. Set aside. 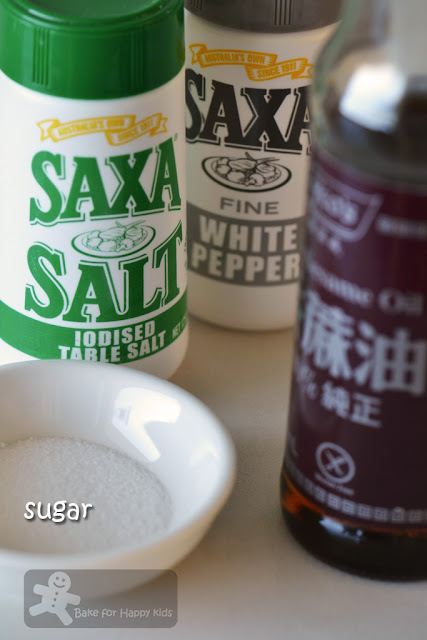 Place oil in a wok or large saucepan and allow the oil to heat up using medium high heat. 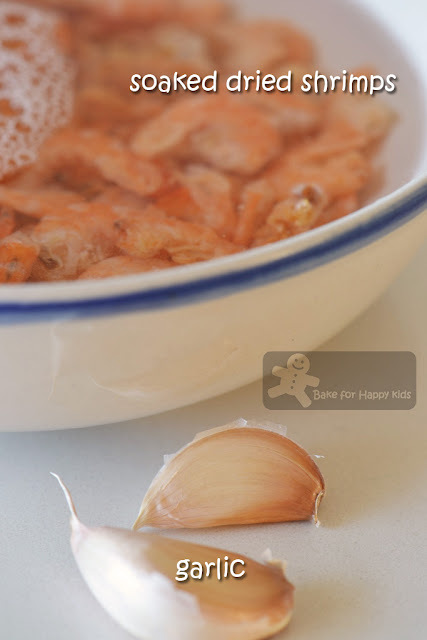 Add garlic and dried shrimps into the hot oil and fry until they are fragrant. Add in the yam and toss and cook for about 1-2 mins until all are combined. Add the combined seasonings and mix well. 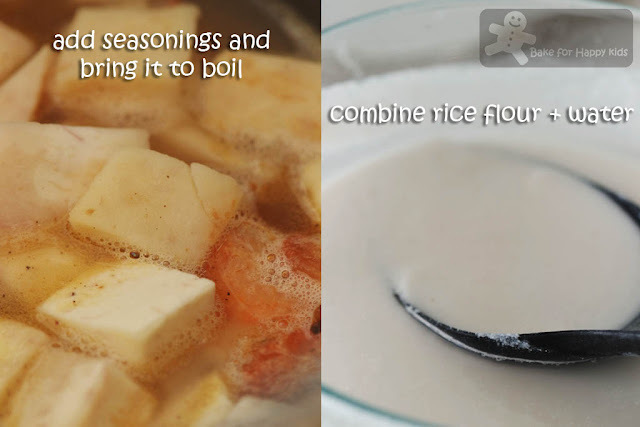 While cooking and stirring, add in the rice flour mixture slowly and cook until mixture thickened. 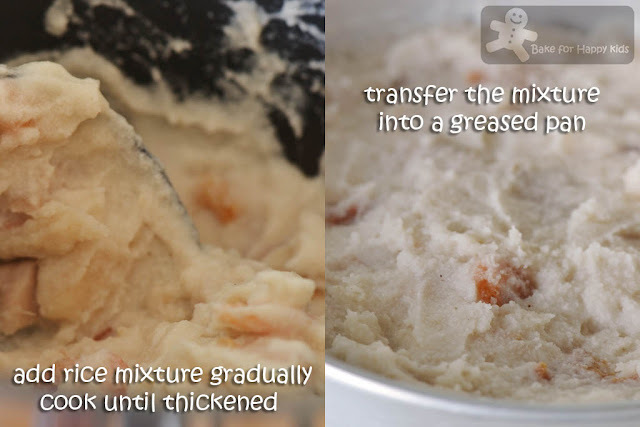 Remove from the heat and transfer the mixture into the greased pan. Using a spoon or spatula, spread the mixture evenly in the pan. 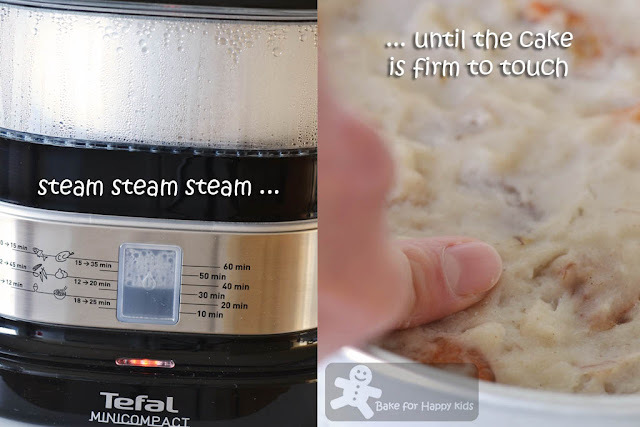 Steam for 35-60 mins depending on the steamer or the heat that you used or until the cake is firm enough to touch. The electric steamer that I used takes 60 mins to steam this cake. Remove and allow cake to cool completely in the pan. To serve, remove yam cake from the pan and cut it into serving sizes. 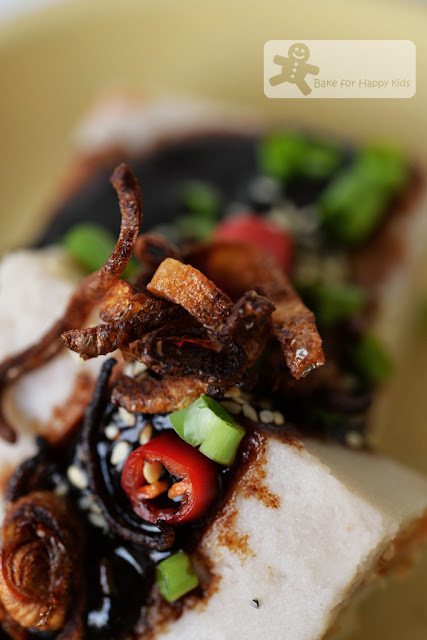 Sprinkle the fried shallot, spring onions, toasted sesame seeds and chilies on top and enjoy with sweet sauce. This recipe is based on my own preference. 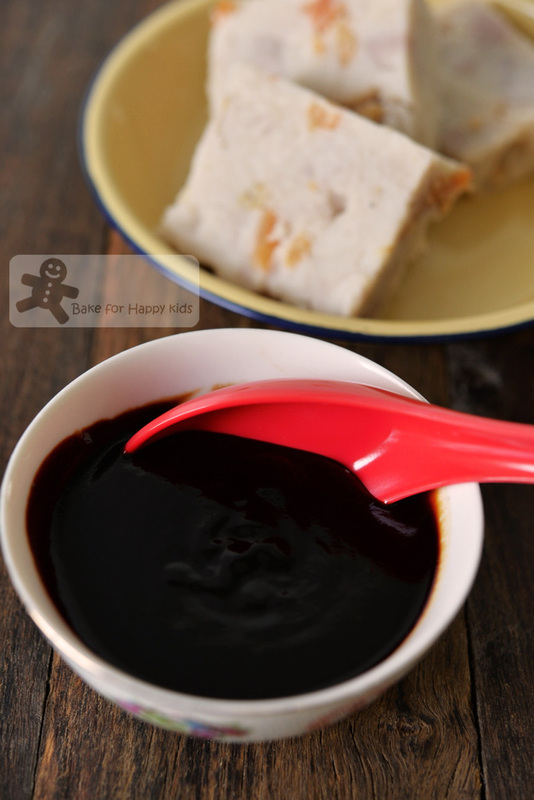 The sauce is sufficient to serve with one 6-7 inches or 16-18 cm yam cake. 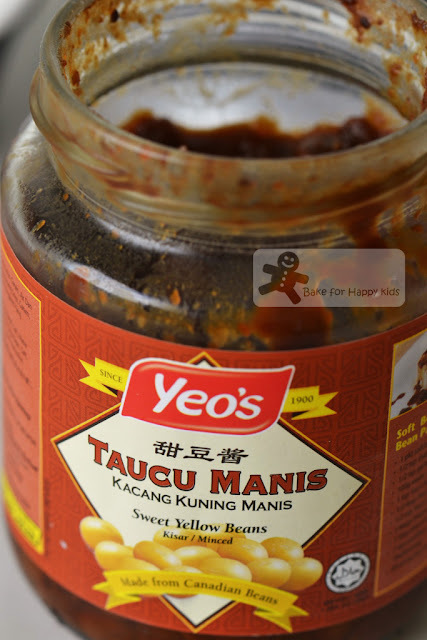 - I prefer using this sweet kind of tau cheo but auntie Hon prefer the taste of the sauce with the fermented beans itself. 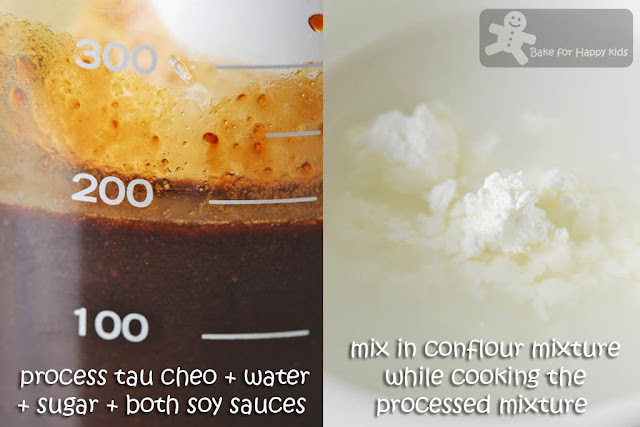 Combine tau cheo or fermented beans, water, sugar and both soy sauces. 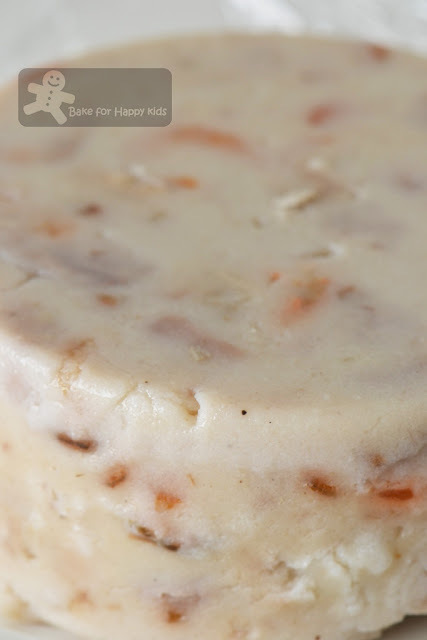 Use a food processor or hand blender to process into a smooth and combined mixture. Place mixture in a saucepan and cook mixture with medium heat for 2-3 mins. Do not boil mixture. 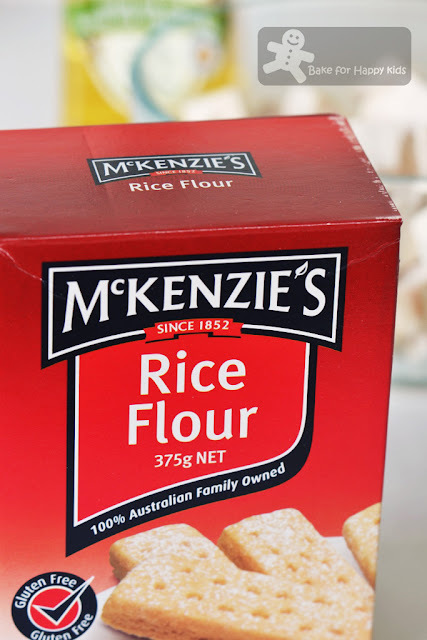 While cooking, stir in the cornflour mixture and continue to cook with medium heat until the sauce thickens and has reached its desired consistency. wow, thats a very interesting recipe. Homemade orh kueh is indeed the best, generous with the yam! I am not a big fan of yam as-is but can enjoy it when made into orh kueh or added into kiam peng (one-pot savory rice with dried shrimps , mushrooms) . My mom loves yam cake so much especially versions with no preserved meat! And personally I like sweet savory dipping sauce too! Agree ! homemade kuehs are the best. Seeing your yummy orh kueh, it reminded me of my late mom's orh kueh too. 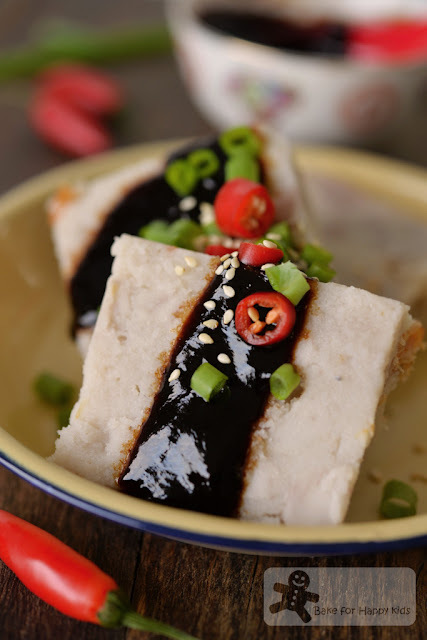 Hi Zoe， This steamed yam cake looks fabulous especially when dip with the sauce! 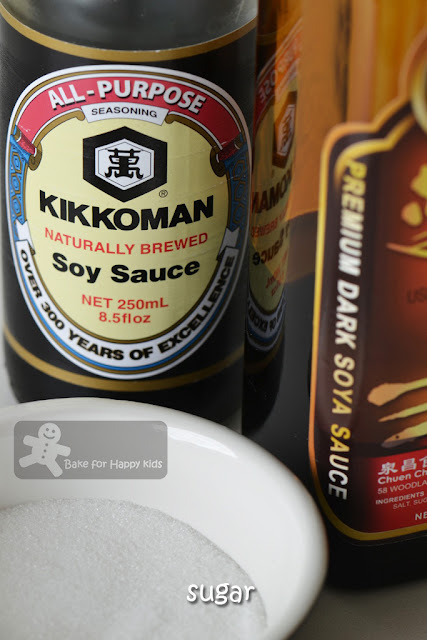 Thanks for sharing your post to BREE#12, Dim Sum! Zoe, I love orh kueh! I prefer it with chilli sauce. Thanks for sharing your grandmother's recipe. I will try it one day! Hi Zoe, anything with yam is my favourite! But I haven't tried your version. I am used to eating those with lots of ingredients on top especially if homemade ones. Lots of crushed peanuts and sesame seeds, etc. and eat with chili sauce. This looks amazing zoe! I'm sure all the ladies in my family would love to eat a home made yam cake! I've always known of the recipe not being difficult to make but have never tried many local recipes. I love my kuehs of all kinds with sweet sauce, fried shallots and spring onions! my inlaw favourite, looks yummy! This is so well done! I love kueh kueh and craving for it now. Ooo...this is one of our favs, Zoe! You've certainly done beautiful with it.